docker-bench-security is a script that checks for dozens of common best-practices around deploying Docker containers in production. We use Docker to save effort, not the other way around. Try docker-bench-security to avoid common pitfalls using Docker. It’s provided by Docker, Inc. Totally free and constantly polished. Enclosed is all you need to know, in order to understand and use the tool. Before we dive deep, please remember there is nothing that is absolutely secure. Nothing. It’s up to you to figure out what your security boundary is, and how you mitigate failures. Security is one of the biggest challenges for docker. Too many pitfalls and potential vulnerabilities. As normal users, not everyone can be or should be a Docker security expert. Here comes docker-bench-security in github. 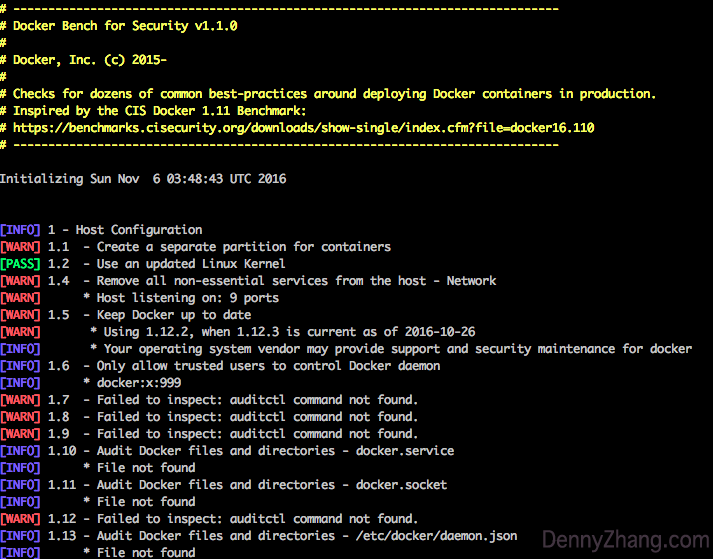 By now, the script enforces 63 known security checks for Docker. To audit OS security, people usually use tools like lynis. To audit Docker security, try this one. 1.1 Enforce docker-bench-security is super easy. Just start a container, run the check, and dispose the container afterwards. No doubt we may get many warnings/errors for the first time. No worry, we will conquer the major ones together. 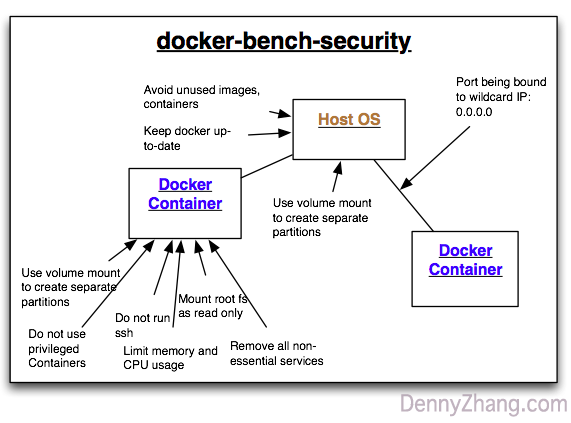 Getting familiar with docker-bench-security is good. More importantly, we learn how to avoid common pitfalls for Docker security. Error Msg. Console output of docker-bench-security. What For. What does it mean and what’s the impact. For docker daemon, create a separate partition for the data folder. It is usually /var/lib/docker. Personally I think it’s also a good practice to do the same for docker containers. Be safe with our key data. Store key data in a separate partition. This will dramatically simplify our backup/restore process. When something goes terribly wrong, we can skip the trouble shooting. Simply start a new container, and mount the volume. 2. For devicemapper storage driver, containers will only have 10GB disk. Without volume mount, we run into low capacity easily. Docker is in rapid development. New version is usually better. The upgrade might fix issues and improve the performance. Warnings: 1. Run rehearsal before upgrading our critical envs. Always install latest versions could be troublesome. 2. Be prepared for potential upgrade failures. Ideally each container should only run one service. If our container listen on multiple ports, usually it would be a violation of this principle. By default, unrestricted network traffic is enabled between all containers on the same host. If our containers doesn’t need to talk with each other, we should disable it. Add –icc=false to $DOCKEROPTS, when we start docker daemon. Another useful post about this. Specify log level, when we start docker daemon. Usually, we can add “-l log” to $DOCKEROPTS. For Ubuntu/Debian, check /etc/default/docker. Don’t use “–privileged” to start containers, unless we 100% need that. Avoid running sshd, thus we can reduce the attack surface. Read more: her. Limit the maximum memory your container can use. Thanks to cgroup, a very good self-protection mechanism. To enable this, we can start containers with -m option. Let’s do a small experiment. With stress we can simulate a process using any given memory. This would be the most dangerous issue, if you’re running docker in public cloud. Let’s say, we start a container like below. And we export the db port 3306. This makes the docker wrapper transparent for end users. Whenever I visit $dockerhostip:3306, it points me to my db service directly. This is super nice, especially for development cycle. However if we expose tcp ports like that, docker will configure our iptables to wildly open. That would be a serious problem, if running in public cloud. Anything can visit our db port directly. Sounds exciting, isn’t it? The most absurd thing is Docker doesn’t support us to customize the behavior. Surely we can manually hack iptables rules, but it would be very tricky. Say when containers restart, container ip will change. Thus iptables rules need to updated manually. Again! See more discussion in reddit. Remove unnecessary or unused docker images. This will help us to save disk capacity. In the future posts, I will introduce more docker security tools. Open source or commercial. Hopeful they will help us to improve our Docker security even more.